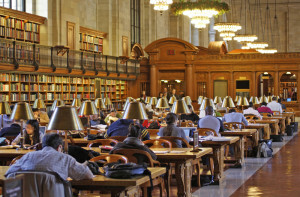 Enjoy free guided or self-guided tours the New York Public Library’s famous flagship building. The building’s architecture is beautiful, both inside and out. 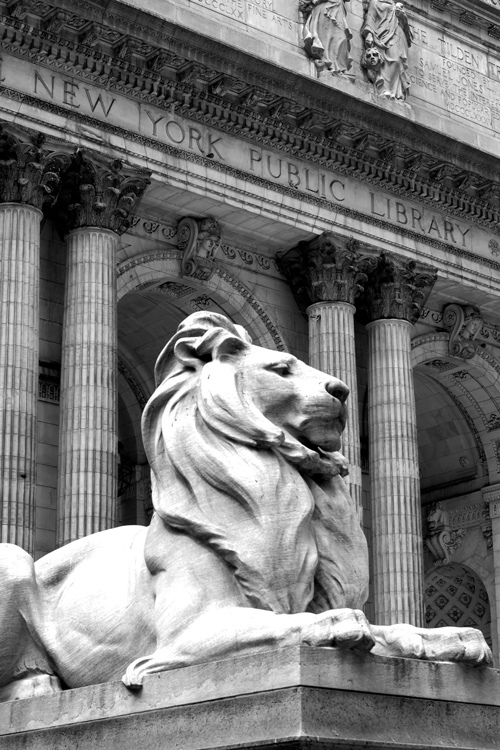 The impressive marble exterior includes a series of columns and arches marking the entrance which is “guarded” on either side by the library’s famous stone lions. The equally impressive interior has vaulted ceilings, lots of huge arched windows, marble, chandeliers, and beautiful woodwork. The library is open to the public, and free guided and self-guided tours are available. The Stephen A. Schwarzman Building is located at the corner of Fifth Avenue and 42nd Street. It’s next to Bryant Park and two long blocks from Times Square. 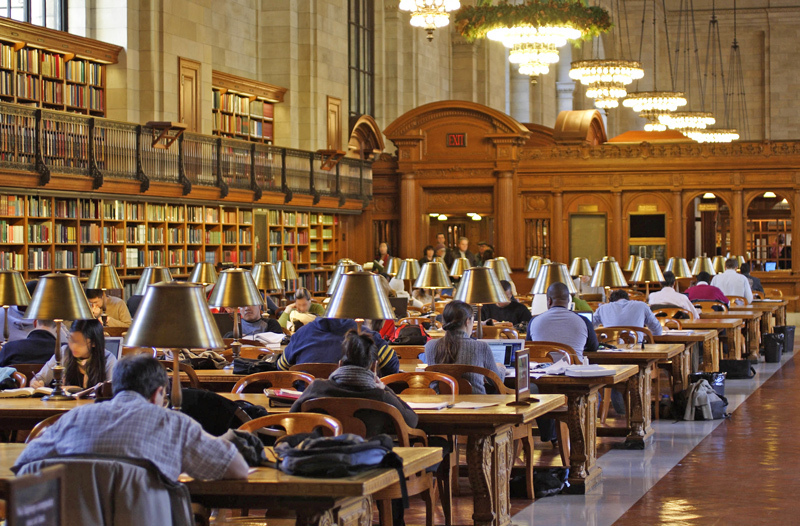 Note: While visiting the library, please be considerate and keep in mind that it is a working research library. Do not bring food or drink into the library. Turn off the ringer on your phone. Be quite when visiting the reading rooms. Turn off the flash on your camera. Guided Tours: The library offers free one-hour tours twice daily (11:00 a.m. and 2:00 p.m.) Monday – Saturday, and once on Sundays (11:00 a.m.). The tours meet at the reception desk in Astor Hall (the main 5th Avenue entry hall), have a 25 person limit, and are available on a first-come basis. Audio Tour: A free (a donation is requested) audio tour of the library is available from the visitor’s desk in Astor Hall (the main 5th Avenue entrance hall). The audio tour takes about 45 minutes and is very informative and will help you find your way around to various things to see. Visitor Film: The film Inside The New York Public Library is shown on the hour and half hour. If you’d like to watch the film ahead of time, it’s available for viewing on the library’s website. Exhibitions: The library features a changing selection of exhibitions and special displays. An exhibition on display until October 9, 2016 is entitled “Preserving a Masterpiece: From Soaring Ceiling to Subterranean Storage” and features documents the Schwarzman Building’s history and ongoing preservation efforts. Visit the library’s exhibitions page for more information on current displays. Winnie the Pooh: The original Winnie the Pooh that belonged to the real Christopher Robin Milne is on display at the library. Pooh, Eeyore, Kanga, Tigger, and Piglet were donated to the New York Public Library in 1987. Pooh and friends recently spent some time away for professional conservation treatment but returned to the library August 3, 2016. The Winnie the Pooh exhibit is in the library’s Children’s Room. Gift Shop: The library has a great gift shop with lots of interesting NYC and book and library-related items available for sale. Bryant Park – Not part of the library, but located right next door, making a library/park visit a good combination. Bryant Park information. More Information – Visit the New York Public Library website for additional information about visiting the library.